The first paragraph of the paper basically lays out an analogy of my main objection to the arguments that I am responding to. So, I’ll just include that excerpt below. Imagine nutrition scientists discover that bodyweight can be changed not only by calorie ingestion and consumption, but by other factors. When science columnists catch wind of these findings, they write up pieces with titles like “Why Calories Don’t Matter”, arguing that gaining and losing weight is not predicated on “any” caloric processes. Some columnists go as far as to recommend that the received, thermodynamic view of bodyweight be abandoned. Obviously, the science columnists’ conclusions do not follow. The scientists did not demonstrate that changes in bodyweight are not predicated on any caloric processes. Rather, the scientists demonstrated that some weight changes are not predicated on “only” caloric processes. That finding is consistent with the idea that bodyweight is predicated on caloric processes, even if not fully. This paper cautions against the science columnists’ any-only mix-up when thinking about implicit bias: the mistake of concluding that implicit bias is not predicated on any instances of a particular process when the evidence merely shows that implicit bias is not predicated on only instances of that particular process. Implicit biases are biases in behavior that are measured indirectly. So, for example, implicit race bias might be measured by observing how people sort pictures of White faces vs. Black faces or how close people sit to a White person vs. a Black person. In contrast, explicit race bias would be measured directly—for example, by asking people, “Do you prefer White people?” It is common to find implicit pro-White biases that are not explicitly endorsed or even explicitly disavowed. For example, someone might show more suspicion of Black people than White people even though that someone is a civil rights activist. Overestimating the evidential value of a psychological experiment. The any-only mixup: citing evidence that something is not predicated on only certain stuff, but concluding that it is not predicated on any of that stuff. However, when we avoid those mistakes, we find strong evidence that implicit bias changes via associative manipulations that are more or less reflective. So, we can infer that implicit bias is probably associative and more or less reflective (i.e., associationism about implicit bias)—contrary to the received view of implicit bias as well as its non-associationist contenders (see Table 2). 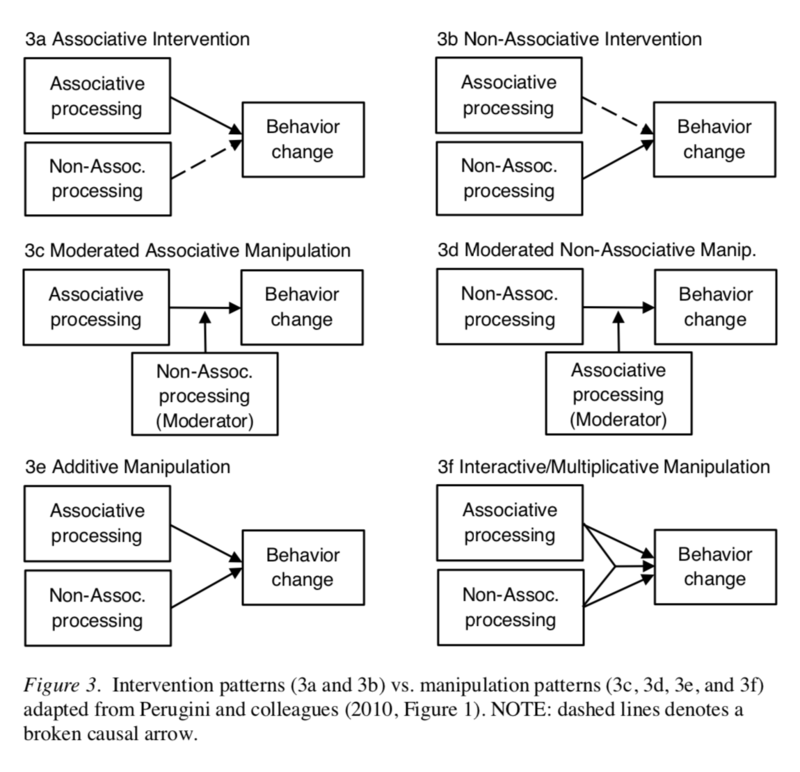 If future (or overlooked) strong evidence suggests otherwise, then associationism and non-associationism about implicit bias are probably false and interactionism about implicit bias should take their place (see 3c, 3d, 3e, or 3f in Figure 3). You might be asking, “What does he mean by ‘reflective’ and ‘associative’?” That’d be a good question. Explication below. Cognitive processing is considered more reflective if it is more consciously represented and deliberately processed while non-reflective processing is less consciously represented and more automatically processed (Shea & Frith, 2016). Cognition is more conscious when participants are more aware of, more able to articulate, and/or more able to process it at the personal level (ibid.). Cognition is more deliberate when it involves more interruption of or less acceptance of the output of automatic processing (Bargh, 1992; Fridland, 2016; Moors & De Houwer, 2006). This explication of reflection will be familiar to anyone who is aware of the famous cases of reflection from philosophy and psychology: someone finds their first intuition plausible, but steps back for a moment to consider their intuition, and then either endorses the intuition or arrives at a new response (e.g., Frederick, 2005; Korsgaard, 1996). Conventionally, cognitive processing is associative if it can be well-described by phenomena such as conditioning or counterconditioning (à la Mandelbaum, 2016). Conditioning and counterconditioning involve repeatedly activating two representations until activating one representation also activates the other representation.